Kate Nowak played “log war” with her classes. I stole it and LOVED it. Her post is here. It really gets them thinking in the best kind of way. Last year I wanted to do “inverse trig war” with my precalculus class because Jonathan C. had the idea. His post is here. I didn’t end up having time so I couldn’t play it with my kids, sadly. 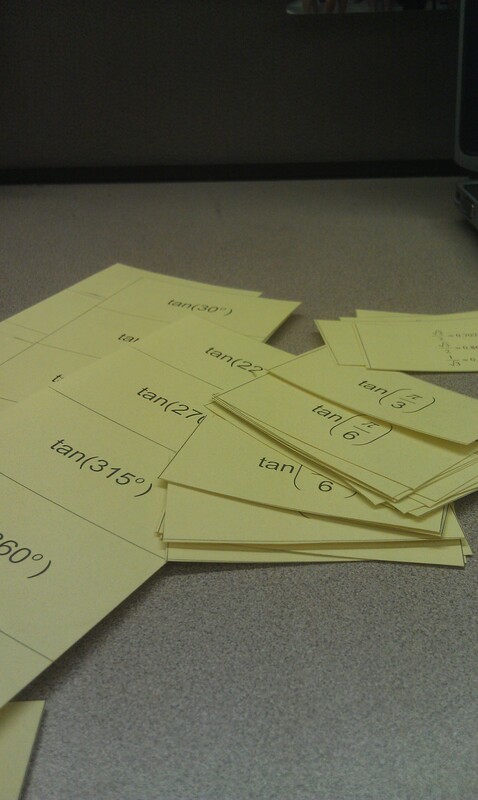 I have a bunch of cards with trig expressions (just sine, cosine, and tangent for now) and special values on the unit circle — in both radians and degrees. You can see all the cards below, and can download the document here (doc). 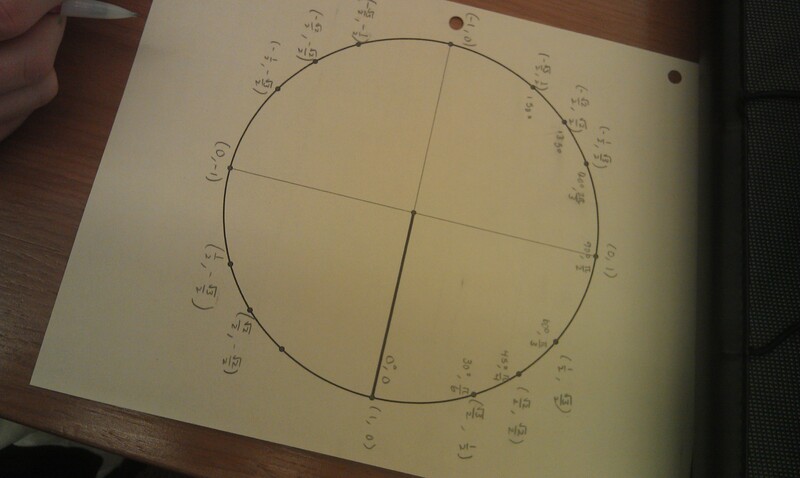 I let kids use their unit circle for the first 7 minutes, and then they had to put it away for the next 10 minutes. I saw that you did this on Twitter and was going to email you for the document. Sadly, it’s too late for me this year, but I hope to use this next year. THANK YOU! Dang it! I taught a lesson on this on Tuesday. It’s filed for next time. P.S. I’d have made undefined the automatic winner. Hahaha, I debated that. I don’t know why I chose to make it a losing card. Why would you make it a winning card? I was thinking because it was like INFINITY it would win, but depending on how you approached it, it would be negative infinity. So I just said, eh, lose. I also imagine a twist: for each round, have a small deck of different outcomes: for example, winner earns 2 points, winner earns 4 points, loser wins 2 points, loser wins 1 point, etc… . Lat that down first, THEN If each kid has a deck of say 12 trig values , give them 5 seconds to pick a card from their deck and play it… ties carry over to next card. Thanks for putting this together, Sam!